The specific hallmark of current Internet-based digital culture is that it is increasingly being determined by modern Artificial Intelligence (AI) technologies. Above all, the machine learning methods (ML) of so-called Deep Learning (DL) are significantly involved in the current transformation of information technologies. The latest advances in AI are noteworthy, not least in one respect: DL is not a new technology at all, but has been known for decades as an exploration of Artificial Neural Networks (ANN). The first technical implementations of ANN took place in the early 1950s. Apart from rare phases of increased academic interest, however, ANN procedures were considered a dead end of AI research for a long time. This changed considerably in 2012. Krizhevsky / Sutskever / Hinton’s research achievements in particular (2012) strongly demonstrated what DL methods can achieve, for example, in the area of image recognition, provided that the ANN training is not only used in conjunction with access to very large amounts of data but consistently on high-performance hardware (eg fast, parallel organized GPU processors). In addition to technical, ethical, economic, and social aspects – and not least due to the numerous advances in the field of AI – the manifold political dimensions of DL and other AI / ML technologies are increasingly being negotiated in public discourse. ML / DL approaches are deployed, for instance, to identify potential terrorists; in simple ways they can already generate political speeches; or they are used to evaluate the behaviour of users on social media platforms for the purpose of political targeting. As the latter example clearly shows, AI processes are also crucial to understanding the medial and political developments and transformations of the Internet. Conversely, technologies with regard, for instance, to the access to large (correctly) labeled data sets are heavily dependent on Internet platforms, applications, and technologies (e.g., program libraries such as TensorFlow or crowd-sourcing platforms such as Amazon Mechanical Turk). The aim of the event is to discuss the diverse political dimensions of Internet and AI technologies. Two perspectives, which are closely related to each other, are at the center: On the one hand, there is the question of how AI approaches, not least with regard to their connections to the Internet, can be characterized as black box technology. On the other hand, industrial-scientific projects such as, in particular, the non-profit research company OpenAI shall be discussed, which, at least according to their mission statement, strive to democratize AI. The event therefore not only wants to critically examine the claims of such companies and projects with regard to their concrete practical realization. Rather, it is about illuminating the medial configurations and constellations of the production of these technologies in an interdisciplinary manner as well as placing them in a theoretically and historically appropriate way, especially with regard to their political implications, functions, and effects. 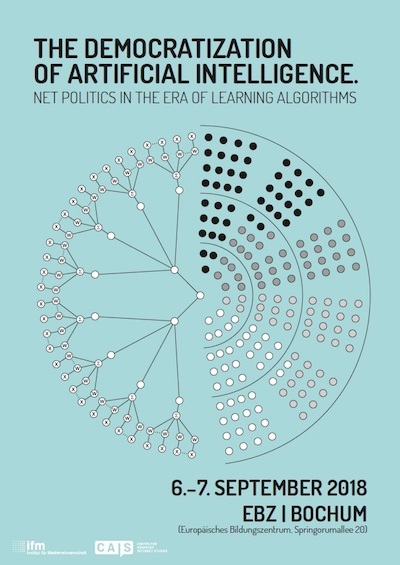 Among others, the following questions shall be addressed: What does it mean to critically investigate efforts of net politics in the age of learning algorithms? How is it even possible to explore the political aspects of modern machine learning approaches if many experts in the field of Computer Science consider ANN technologies as a black box, fundamentally opaque to human understanding? In what way does such an assumed opacity of ANN/ DL approaches affect questions of accountability and political agency? Are technological strategies of an Open or Explainable AI already able to reduce the opacity of ANN/DL methods? What political and/or critical concepts guide the technological process of making modern AI technology more accessible? And how can we think about suitable ways of democratizing AI beyond abstract aspects of transparency or accountability?